At Deeter Electronics, we manufacture bespoke liquid level sensors and float switches according to your specifications, utilising our expertise in liquid level sensor design and manufacture to develop advanced solutions to suit your requirements. From monitoring levels in storage and buffer tanks to ensuring beverage bottles don’t overflow, liquid level measurement and control is an important application in a variety of industries. Based on the installation situation, medium properties, and ambient conditions, our portfolio of process instrumentation level sensors will provide you with the right solution for your application. Between 70 to 80% of all sensors manufactured by Deeter in our UK factory are custom designs. Our extensive experience gleaned over 35 years and our back catalogue of thousands of designs ensures a new custom design can easily be created by our team of engineers. This depth of knowledge, understanding and experience means that in most cases a totally new custom sensor design can be created in 1-2 weeks. The only design costs you bear is that of the technical assembly drawing. With over 35 years’ experience, the Deeter Electronics engineering team have the expertise to design and produce a high quality reliable custom level sensor or switch. Take a look at some of our custom sensor case studies below. If you have a requirement for a liquid level sensor or float switch which is not covered by our existing range of level sensors and float switches or you would like to customise one of our standard designs, please call on +44 (0)1494 566046 to talk through your requirement directly with one of our experienced technical representatives. If you would prefer you can submit a request for an estimate LINK and one of our technical sales representatives will be in touch to talk you through a solution. Deeter develop completely bespoke designs and manufacture level sensors to your own designs or modify the design of our existing products to meet your needs. We offer a wide range of float designs for different liquids with different specific gravities and probe materials, including corrosion free food grade 316L stainless steel, PVC and polypropylene for water and acid monitoring systems. Sensing may be via reed relays or Hall-effect diodes and sensor length, control head and output cable may all be custom. We at Deeter custom manufacture level sensors and float switches according to customers’ specifications to provide effective bespoke solutions. We can combine your specifications with our expertise in level sensor design to develop a custom solution to suit your requirements. Click for more information on Custom Continuous Level Sensors. Our custom length multi point level switches are an extremely versatile and cost effective way to monitor multiple liquid level points within a single tank. These multi position floats can be configured with two to seven independent switching levels, depending on your requirements. 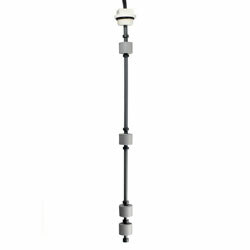 Click for more information on Custom Multi Point Level Switches. This is a custom made liquid level sensor for a client which was to be used in ultra pure water requiring suitable materials specific to this requirement. The client sent in a design specification, the alterations included a custom length PVC shaft, polypropylene float, PVC 1” BSP fitting, 0.25m cable with 3.5mm jack socket and plug connector and 4 switching positions across the shaft. This customer had many application specific requirements for this bespoke sensor, these being: the ability to handle high temperatures up to 200 degrees Celsius and down to -50 degrees Celsius, cylindrical float instead of standard spherical float and shaft to be of standard size ASTM A269. The design for this sensor was given by the customer. They needed the level sensor to be able to withstand the corrosive environment it will be working in. The sensor was subjected to a high solvent atmosphere therefore the shaft was made of a stainless steel and the float was made of polypropylene. The end stops were laser welded to produce a strong closure.